Since the EU 261 regulation was passed in 2004, passengers have been protected against severe flight disruption. The legislation confirms that long delays, cancellations, missed connections and flight re-bookings cause great inconvenience to the passenger, and as such affected passengers should be compensated. Who does the EC Regulation 261/2004 apply to? Flying on free or reduced tickets under customer loyalty or promotional programmes. Passengers travelling on a free or reduced fare that is not available to the public either directly or indirectly. Why is the Air Passenger Rights Regulation in place? The EU regulation is in place to protect passengers against the inconvenience caused by long waiting times or flight cancellations, which the airline had the power to prevent. This is the ruling as stated in full: “Regulation (EC) No 261/2004 of the European Parliament and of the Council of 11 February 2004 establishing common rules on compensation and assistance to passengers in the event of denied boarding and of cancellation or long delay of flights.” The regulation provides passengers with protection against travel disruption, and also serves as an incentive for the airlines to maintain a more punctual operation. These rights also apply for passengers travelling on a package holiday. It is intended for passengers who suffer delayed or cancelled flights, overbooking or denied boarding. Depending on the circumstances, and subject to certain conditions, it may give rise to a claim for compensation of between €250 and €600 per person. It provides assistance and access to basic services in the event of flights cancelled or delayed for several hours. It offers the right to request a seat on another flight or to withdraw from the scheduled flight if it is cancelled or delayed by more than 5 hours. It obliges airlines to inform their passengers of flight delays and cancellations and their rights. Based on the 2004 EU261 ruling, your flight must either take off or land in the European Union, in the latter case the airline must also have is headquarters in the EU. Your claims are valid up to 6 years retrospectively. It does not matter whether you took the flight as business traveller or as part of a package holiday, it is the person who suffered the inconvenience of the flight disturbance who receives the compensation. Overbooking: The airline overbooked your flight and you will not find a seat on board, which is equivalent to denied boarding. Missed connecting flight: If the final destination is reached 3 or more than 3 hours later due to a missed connecting flight This also applies if the connecting flight was operated by another airline as long as your ticket is valid for both legs of the flight. 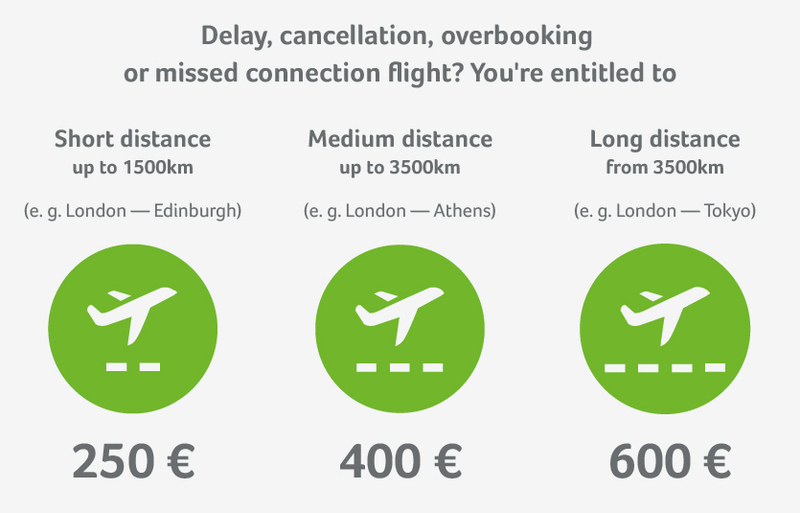 The amount of compensation is dependant on the distance of the flight - not on the amount you paid for your ticket. All airlines must clearly and completely inform its customers about their rights as air passengers. They must inform you by means of warnings at the time of invoicing, written notices in case of delay and updated information on their own website. The Berlin Regional Court decided (judgment of 8 October 2015, exp. : 52 O 102/15; judgment not signed) that the Germania airline had to stop incorrectly informing its customers about their rights in the event of significant delays and oversold tickets. An information sheet published on its website on the payment of compensation and assistance in the event of overbooking, cancellation and substantial delays described passengers' rights in an ambiguous and partially false manner. It did not contain an indication of the payment of compensation from €250 and €600, nor did it mention the possibility of reimbursement of the ticket price or the free flight back to the point of departure in the event of flight cancellation. Are you currently affected by a flight delay and strike or bad weather conditions are not the cause? Find your delayed flight in our table, check your entitlement for compensation in our claimcheck and let Flightright enforce your claim for you. If the airline provides you with vouchers - which are usually much less than compensation payouts - this does not negate their responsibility to issue you your compensation. The first the thing to do is to establish that you actually have a valid compensatory claim. This can often be a long and drawn out process: flight databases will need to be accessed, similar legal cases will need to be compared, and you’ll need to check whether your case applies under European Regulation No. 261/2004 etc. The logical solution is to make your compensation claim with Flightright. You just need to enter your flight details into our free compensation calculator, confirm that you have a valid claim against the airline, and we’ll take care of the rest. We have enforced over €100 million for affected passengers. The claim check calculator analyzes hundreds of thousands of flights and the corresponding meteorological data to check whether your case applies under the EU regulation. You will receive an immediate evaluation of your case, free of charge. More than 3.2 million passengers have already made use of our services. Get started and establish whether you’re eligible to a compensation. If the compensation calculator indicates that you are entitled to a compensation, then you have the option of instructing us to defend your claims. By doing so, you benefit from a reliable, knowledgeable and committed partner to help you get your claim through to completion. We have the know-how to negotiate with the airlines and the sort of attempts they make to avoid paying their passengers what they are owed. This enables us to represent our customers’ interests against large airlines on a much more level playing field. We’ll make sure that you get the compensation you deserve, even if it means going to court, where we currently have a 98% enforcement success rate. Which rights do I have during waiting at the airport? In the case of overbooking you immediately become entitled to additional services and benefits. In cases of flight delays and cancellation, further rights become available: if you have waited at the airport longer than 5 hours, you’ll be entitled to cancel flights. If your flight is postponed until the follow day, the airline must accommodate you in a hotel for the night. Further information about these rights can be found on our flight delays page, or our flight cancellations page. An exception is made if the airline could have prevented the problem. An example would be if the airline blamed bad weather for flight disruption, and what actually happened was that the airline failed to ensure that there were adequate supplies of de-icer before the onset of winter. In this case the airline can be held responsible for the delay, after all they could have prevented it. A crucial indicator of a situation like this is if other flights were operating during the bad weather. You encountered these problems on a flight operated no more than 6 years ago. A delayed flight isn’t something you just have to accept. Our guide shows you when you are entitled to compensation. You can also find out what you are entitled to if your departure is delayed and in what circumstances you can choose not to fly. Was your flight cancelled just before you were set to depart and brought forward or delayed by several hours or even days? Then take a look at our flight cancellations guide. You can find out not only when you are entitled to compensation but also whether you should book another flight at your own expense and when you can choose not to fly. You’ve already packed your suitcases when you find out that you have been moved to a flight departing a day later. What an inconvenience! We have put some clear information together for you on your rights if your flight is overbooked and your booking is changed against your will.